Here at Stanley we offer an extensive range of stair climbing and vehicle loading solutions which not only eliminate the risk of injury, but increase the level of productivity and efficiency during material handling process. The Stanley Sprinter range are lightweight and the smallest models in our portfolio. 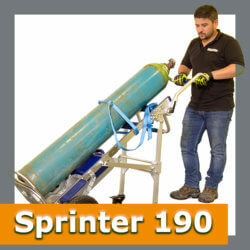 They can handle weights between 150kg-190kg and are highly portable. They feature touch button control, puncture proof tyres and removable, rechargeable batteries. They also offer two speeds, 34 steps per min/17 steps per min. We offer a few variations of the PowerMate models, the first being the L series. 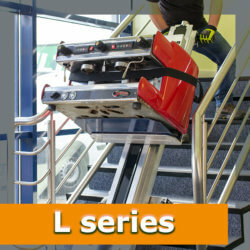 These machines can lift loads up to 318Kg, with the LE1 featuring a moveable toe plate. 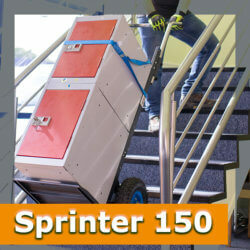 What’s great about this design is its ability to transport loads up and down stairs and then onto a surface using a single operator. 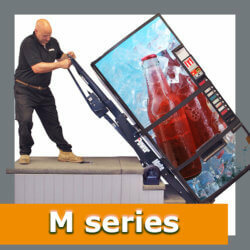 The M series on the hand can deliver an impressive loading capacity up to 680Kg. These machines are primarily used for the heaviest loading applications such as vending loads, fridge freezers and many more.